Ant-Man #1 (Published by Marvel Comics; Review by Draven Katayama; ‘Rama Rating: 10 out of 10): Scott Lang is a man needing a second chance – or as a surprise friend states here, a seventeenth chance. Nick Spencer writes a pitiable, likable Scott who bungles conversations like Matt Fraction’s Clint Barton. 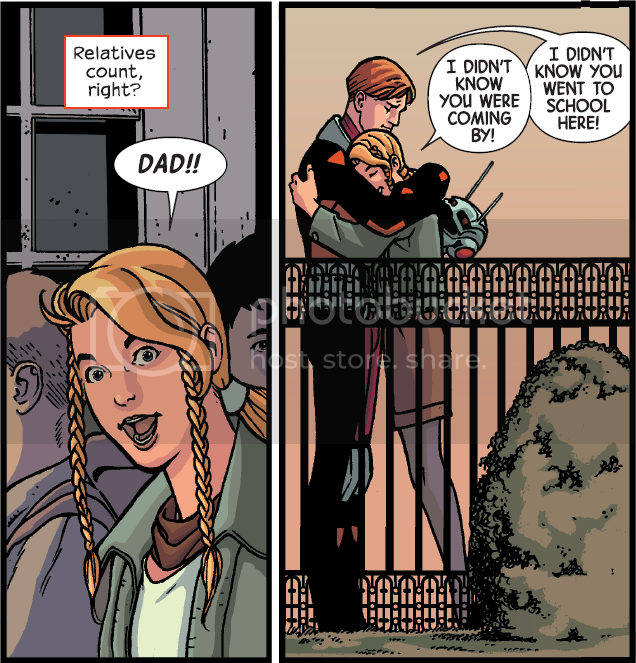 We sympathize as Scott tries to secure employment, but our hearts really melt when Cassie Lang enters the story. Spencer is skillful at not overdoing humor, and at addressing weighty issues like incarceration and parental rights after divorce. Ramon Rosanas’ style is immaculate: characters are outlined with a single heavy ink line, and receive no hash marks of shading on faces. Beetle’s outfit and Peggy’s outfit and hair are exceptional work by Jordan Boyd. Writing this good is rare. Spencer introduces Scott’s life perfectly with never an unsympathetic moment.